Susan’s sculptures remind us of the inevitable passage of time and the always present need for love. Her greatest influence is her father, a Russian immigrant whose art captured the horrors of Cossack marauders and the beauty of his adopted country. Throughout her life she has found that art enables her to understand what she sees, allows her to express what she feels. The daughter of “older” parents, it is not surprising that many of Susan’s sculptures depict older men and women who, though wrinkled and stooped, revel in everyday moments. 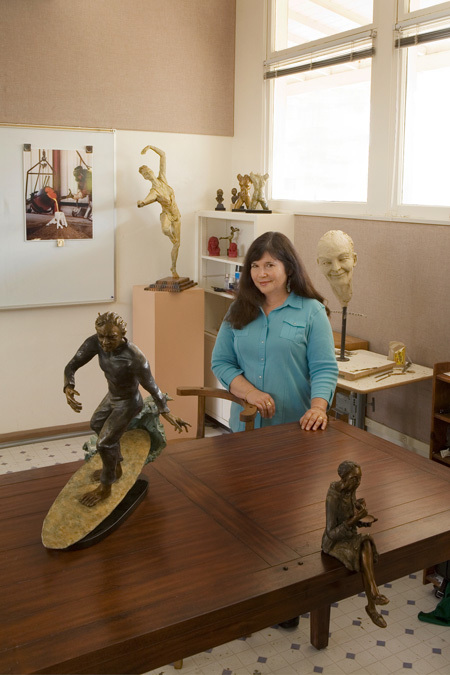 She credits FOTM documented artists Linda and David Elder for her interest in bronze. Susan’s sculptures reveal an artist who connects lovingly and gently with her world. Susan R. Kaufman’s in-depth oral history and documentation took place in 2010, Sponsored by Yvette and Richard Franklin. The FOTM Archive contains extensive information about this artist.